Identification must be attached to cable devices that are set on either private or public land, and on fish houses left unattended on the ice. While on wildlife management areas, identification is required on items such as ground blinds, tree stands, cameras and traps. NOTE: There may be specific requirements for how identification is displayed on different types of equipment. Be sure to review the appropriate hunting or fishing guide for details. After accessing "My Account", click on "New Registration" under the "Current Registrations" heading. An equipment registration number will be generated for you. 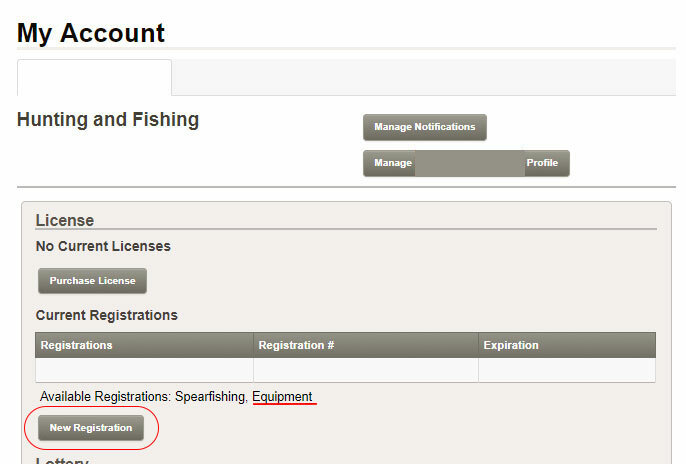 This number will display under "Current Registrations" on your account page. Note: One registration number will be issued that can be used on all equipment that requires identification.